I just fixed my horn issue, first I jumped the prongs on the horn with a battery and it worked , then I took apart the left hand control housing that the horn button is in. there is a turn signal switch located over the over the horn button so I removed it by taking out 1 screw , that exposed the horn button. then I sprayed a electric contact cleaner into the button housing and pressed it a bunch of times, after I let it dry a bit, I then sprayed Deoxit-5 into the button housing and pressed the button a bunch more times , then I switched the bike to on and hit the button. If you try this make sure and spray/clean and operate the turn signal and hazard switch too. Use one of those straw extensions for your sprays and aim in between the moving button part and the fixed button housing . I also did similar last week but also scraped a bit of black paint off the handlebar where the switch housing clamps to the bar. Horn now sounds better than it has in years. Horn button earths to the switch housing and switch housing earths to the handlebars and so on. Yeah, my horn button only has 1 black/white too, probably the simplest circuit on the bike. bluej58 wrote: Yeah, my horn button only has 1 black/white too, probably the simplest circuit on the bike. Yep, a pretty simple circuit. We have safety inspections in MO that are required to get license plates. A working horn is required by state law. Also, if so equipped with turn signals, they are also required to work. I just had my bike inspected last Friday, and as usual, it passed with flying colors. Since >all< MO motorcycle plates also expire every April (unlike cars with different months) . Located in the Saint Louis, Missouri Area. Illinois use to have all bike plates expire Jan. 1 which sucked because nobody buys plates in the middle of Winter and sure enough a nice day would show up and I couln't ride , now it all depends on when you register and no safety checks. bluej58 wrote: Illinois use to have all bike plates expire Jan. 1 which sucked because nobody buys plates in the middle of Winter and sure enough a nice day would show up and I couln't ride , now it all depends on when you register and no safety checks. Jan 1 does seem stupid. AND it would be pretty nippy riding to the local inspection station, which also brings up another valid point, safety inspections are a GOOD thing. Especially after seeing some of the so called "improvements" some people do these poor bikes. (Yours not included) I still need to pay my personal property tax and go pay again to get my new and improved MO tag. Must be this tall to ride, not because you can't touch the ground. 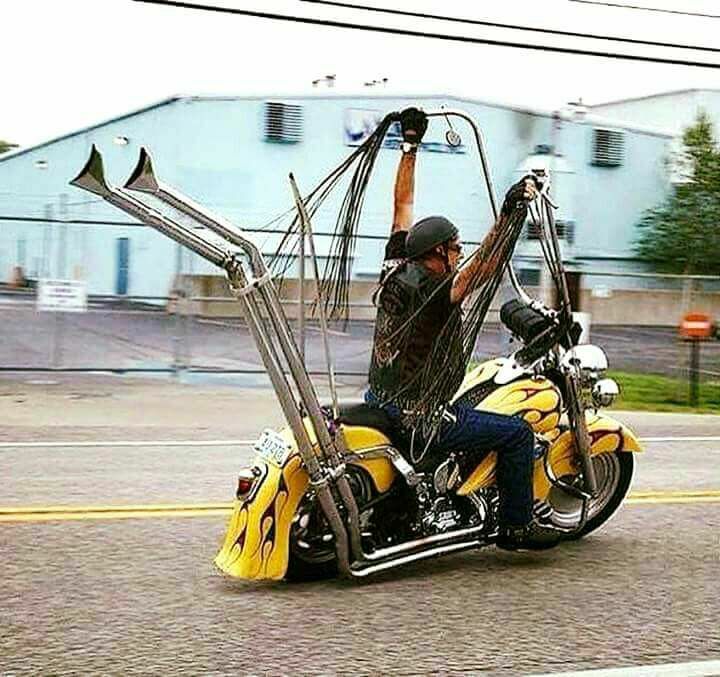 Because you cant reach the handle bars. You think he does pull ups down the road? Can't be above you armpits but you see them all the time with "BIKERS". When you're ready, we can direct you to tracing down the path for the horn power (and ground) using a voltmeter. Do you have a voltmeter? If not, you can one that works for pretty cheap. The Harbor Freight $4 meter works ok, but the test leads that come with it are usually faulty... so you can save money on the meter, but then you have to buy new leads. loudhvx wrote: When you're ready, we can direct you to tracing down the path for the horn power (and ground) using a voltmeter. Do you have a voltmeter? I have access to a good voltmeter, yes. I haven't had time to check with my alligator clips to see whether the bad connection is from the ground or the power supply just yet though. Should I try that first? Sure. That could provide a quick way to tell which side you need to focus on. From the horn, pull the negative wire and connect a wire from that connection on the horn to the ground of the battery. Make sure you pull the negative wire and touch your jumper wire to the horn's connector. That way, if you accidentally pulled the wrong wire, it won't blow a fuse. If the horn makes decent volume, then it's the switch and ground side you need to troubleshoot. If the horn still sounds weak, put the wires back the way they were. Then pull the positive wire off of the horn. Then connect a jumper wire from that horn connection to the positive side of the battery. You will also have to press the horn button. If the horn sounds loud, then you have to troubleshoot the positive side power path. If the horn still sounds weak, then it's a combination of the positive side and negative side. Okay, it has stopped raining long enough now to get out here and test it. I tested the negative side and the horn was loud and crystal clear. I tried the positive side and its completely weak. I will be going to visit my parents for Easter dinner today and will be able to check the bike with the voltmeter there. How should I proceed? I take it that when I jumpered the negative horn terminal to the negative battery post and the horn sounded strong and clear, then the fault lies within the ground circuit somewhere? The most likely weakpoint is probably the horn button itself. You can just take it apart and inspect the internals for corrosion, loose wire etc. Or you can use the voltmeter...whichever you are more comfortable with. These instructions are not the simplest, so you might want to print them out or have them handy. To use the voltmeter, first wire everything up as it should be. Then put the black probe on the battery's negative terminal. Put the red probe on a clean spot on the handle bar. Use alligator clips if you have to, otherwise you might need 3 hands. The meter should be showing near zero volts. Then press the horn button and watch the meter. The voltage should stay at nearly zero volts. If the handlebar voltage just stays near zero volts all the time, then the problem is the switch, or wiring before the switch. If the handlebar voltage is significantly above zero, like 2 volts or more, then there is a frame ground problem, (but you might still have a switch or wiring issue). To check for the ground side switch/wiring voltage loss, put the meter's black probe on the handlebar, and the red probe on the negative side of the horn (which is still wired up normally). The voltage should be somewhere around the same as the battery. Then when you press the horn button it should drop to near zero. If it drops, but only down to about 1 or 2 volts (instead of zero) then you are losing voltage in the wiring from the horn to the switch, and/or at the switch itself.